NOT so long ago, a Kia travelling through Melbourne's affluent suburbs would have been a rare sight. Yet our recently updated Optima cut a swath through leafy surrounds and confidently mixed it with the German marques which have traditionally been the weapon of choice for the well-heeled. Kia has come a long way in a short time, and there are few better examples than the Optima. It has been around for a few years, but the design, drivability, fit and finish is difficult to fault. Pricing has risen slightly across the range, but the extra coin is worthy of the specification upgrades. The Si is now $30,990 (up $300), mid-spec SLi is $35,990 (increased $1000) and Platinum is $40,490 (raised $1200). Upgrades to the mid-sizer coincide with the first generation Optima's unveiling at the Australian Open back in 2011. It plays in a competitive mid-size segment where sales were down 16.4% last year, with key players the Toyota Camry, Mazda6 and Honda's Accord. 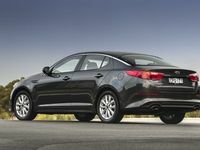 Australians are gravitating toward SUVs and smaller hatches, but for buyers who still want space and comfort, the Optima remains offers a roomy cabin and good bang for your buck. Inside and out, it looks the goods. The quality, fit and finish is edging toward the Europeans. Travelling in the high-grade Platinum model, there were no disappointments with the styling. Some previous Kia interiors have fallen short of modern expectations but the Optima ups the ante. The chrome trim has been replaced with a satin finish, while the centre stack wears a more up-market, high-gloss black. Up front, and the seats are much improved. They have larger bolsters and better under-thigh support, which made for a comfortable ride. Families can appreciate the sizable back seat and, being a front-wheel drive, there is additional leg room for anyone sitting in the centre rear pew. 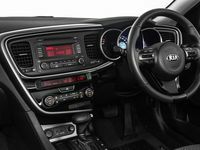 There have been no mechanical changes, and Kia has stuck with the 2.4-litre four-cylinder petrol partnered with a six-speed automatic. With linear power delivery, the Optima gets along nicely with minimal fuss. Whether around town or on the highway, it's adequate for most drivers' needs. Accelerate hard and the four-potter does tend to sing and the power shunt isn't likely to throw you back into the seat, but that is something not typically required by buyers in this genre. When we first sampled the Optima a few years back, the steering was extremely light and lifeless, this has been addressed in subsequent models and it's now well-weighted and much more responsive. The suspension tune is firm, perhaps too hard for some, although we were riding on the larger 19-inch wheels and some may prefer the smaller alloys for a softer ride. There is improved specification across the range. 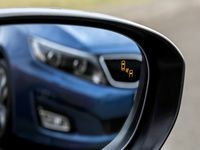 Optima Si has gained front parking sensors (rear were standard), which is added to equipment such as alloy wheels, automatic lights, cruise control, six-speaker MP3 compatible CD stereo with USB input, along with Bluetooth for phone and audio connectivity. SLi models now have leather trim, and also add sat nav for the 17.7cm display, Infinity stereo, sports pedals and daytime running lamps. Range-topping Platinum now has a high-end TFT information screen, blind spot detection and lane change assist as well as a ventilated seat for the front passenger. It also has goodies like keyless entry with push button start, and a more sporting external appearance with a special grille mesh, lower air intake and a rear diffuser. There is a pair of cup holders front and back, along with bottle holders in each door. Through the console storage spots are available for phones, keys and other items. Families would appreciate the internal space, with enough leg, knee and shoulder room for five adults. The Optima also has a sizable boot, aided by 60-40 split fold rear seats. Peter Schreyer is a genius. The designer came across from Audi and has been delivering in spades for Kia. This is a timeless design … first released in 2011, it hardly looks a day old. These new variants can be spotted via minor changes to the front and rear fascias. SLi and Platinum models also get some pretty slick looking machine finished alloys, but with dual pipes and the aerodynamic profile, it fights the Mazda6 for best looking car in this segment. Achieving average fuel consumption of about eight litres for every 100km - that's about par for the mid-size four-cylinder course. Being non-turbo should mean pretty reasonable insurance premiums. 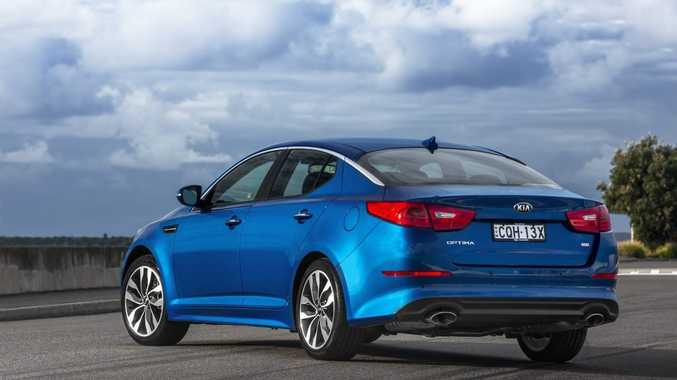 The Optima proved its worth in the recent motoring clubs' running costs survey, proving to be the third cheapest mid-size car to run behind the Volkswagen Jetta and Toyota Camry Hybrid. What we liked: Good exterior looks, new safety features on Platinum model, quiet ride, steering feel compared with early models. What we'd like to see: Hatch variant could widen appeal, perhaps Kia's 1.6-litre turbo engine. Warranty and servicing: Five-year unlimited kilometre warranty. Servicing is annual or every 15,000km, average price is $377. Engine: 2.4-litre in-line four-cylinder generating maximum power of 148kW @ 6300rpm and peak torque of 250Nm @ 4250rpm. Bottom line plus on-roads: Si $30,990, SLi $35,990, Platinum $40,490.